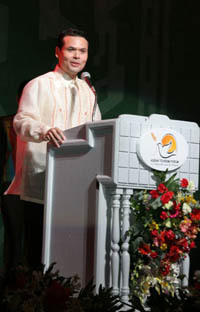 Tourism Secretary Joseph Ace Durano in Paris. The Philippines took center stage as "Destination of the Year"during the recent 2008 10th Salon de la Plongee, an international diving trade show in Paris, France, Ms Maricon Basco-Ebron, tourism director and attache at the Philippine Embassy in Seoul said . Quoting a dispatch from Philippine Ambassador to France Jose Abeto Zaide, she said the Philippines, taking its first plunge at the Salon de la Plongee sous-Marine (SCUBA Exhibition) at the Exhibition Park in Porte de Versailles, was named the event's Destination of the Year. Tourism Secretary Joseph Ace Durano led a Philippine delegation of 10 exhibitors. She said the Philippine exhibit was a sure crowd-drawer, especially with the world-renowned Bayanihan National Folk Dance Company gracing the event. The Philippine booth near the main entrance accommodated about 10 companies showcasing their respective dive resorts around the country. The 10th Salon de la Plongee sous Marine was joined by about 402 exhibitors from 40 countries and drew 39,342 visitors, with 232 journalists covering the event. Exhibitors included tourism agencies and diving equipment manufacturers. Secretary Durano assured the participants that travel to the country's marine parks and sports attractions is relatively safe, she said. "We are taking a more assertive role in pushing our beaches and aqua sports attractions to the European traveler. Private businesses that were with us in previous marketing missions have gained significant benefits and 2008 will open more opportunities," Durano was quoted as having said. Known for dense marine biodiversity, Philippine waters offer rewarding diving experiences. Top dive sites in the country include the Tubbataha Reef, a UNESCO World Heritage Site.